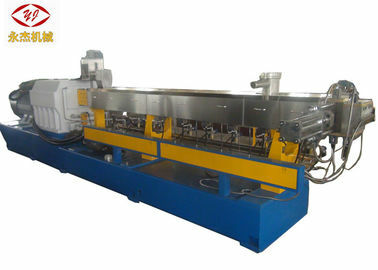 Nanjing Yongjie started to make water strand twin screw extruder pelletizing machine since 2001,our twin screw extruders are widely used for enforcing modification, degradab le master batch, anti-flame master batch etc. Reinforcement and modification: filling glass fiber or carbon fiber for :PP, PA, PBT, ABS, AS, POM, PPS, PET etc. Compounding and blending: PC+ABS, PA,+ABS, PP+EPDM, PA+EPDM, PP+SBS, etc. Filling modification: filling Caco3, Talc, Titanium, carbon black for PVC, PE, PP,EVA etc. Cable material: LDE, HDPE, LLDPE, MDPE, drive pipe, insulation material, crosslinking material, cable coating material, thermal contraction material etc. Special application material: PPR pipe compounds, PE crosslinking tube material, cigarettes filter tip material, acetable fiber material etc. Thick color masterbatch: PE, ABS, PS, EVA, PET, PP+ pigment + additives, etc. The biodegradable masterbatch: PP, PE, PS+ starch + additives etc. Special screw array with wear shear of flake material, super power vacuum system to reduce IV loss maximumly. 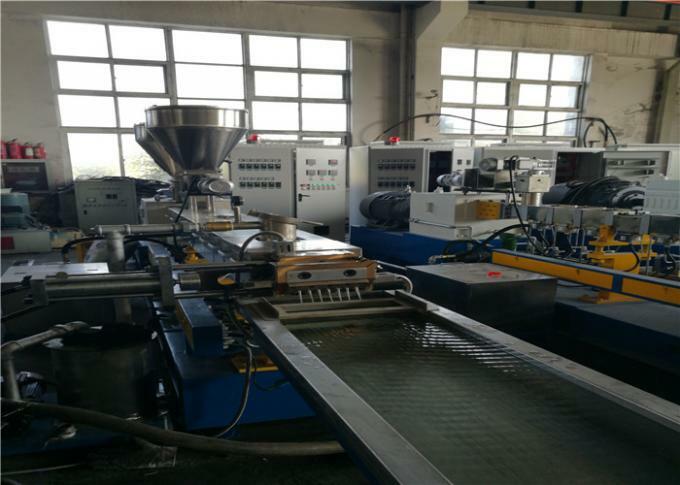 Nanjing Yongjie Qixin Machinery Equipment Co.,Ltd Founded in 2001, covers an area of 20,000 square meters on our own land, with monthly output of machine 20sets. 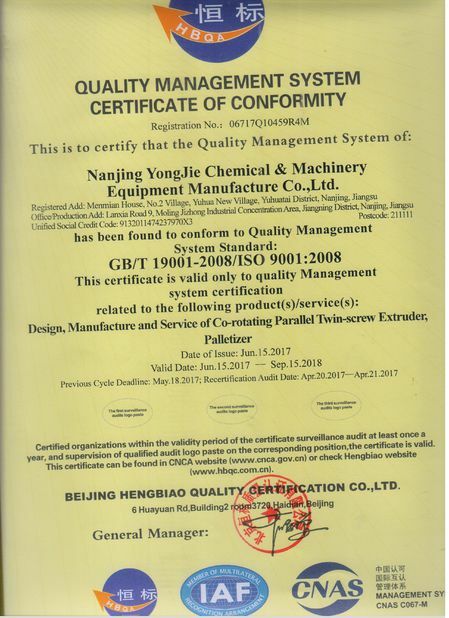 Our factory is certificated to CE, ISO9001:2008.The company concentrates on research, development and production of “high level, accurate, highly sophisticated series product parallel co-rotating “cordwood” twin screw extruder, single screw extruder, two stage extruders and automatic plastic pelletizing machines. We have provided customers first-class products with “strong torque, high production, energy conservation and environmental protection products. The special designed screw structure has realized successfully for “one step shaping” on many kinds of products, and is widely used in aluminum composite plate, XPS foaming plate, WP plate, PP, PE sheet industry, etc. 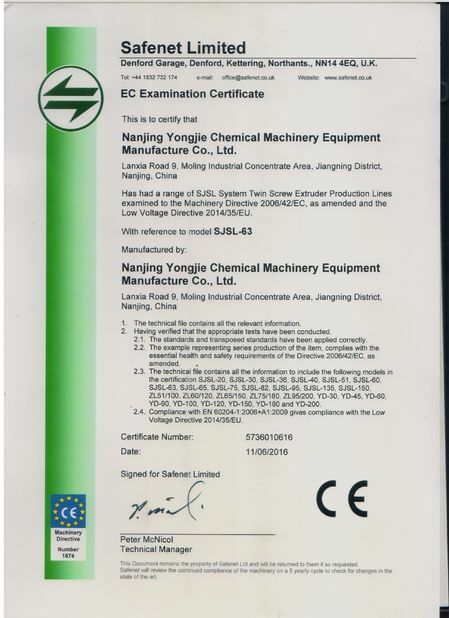 QAULITY IS PUT AT THE FIRST , and our factory is certificated to ISO 9001:2008 and CE.